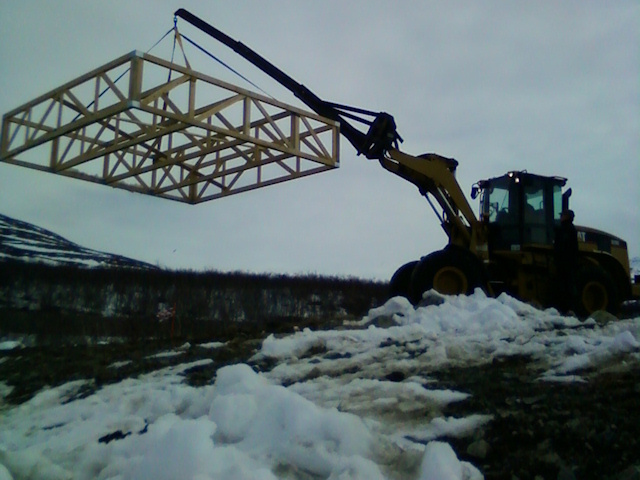 The final stage in clearing the area where the raised test tile was, is to get the frame itself out of the way. This also provided a useful test in that we could experiment with the moving of an entire frame using the 15-tonne digger provided by the local Kilpisjärvi contractor. 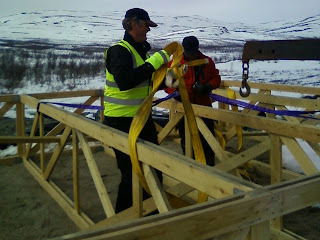 Markku Postila and Toivo Iinatti attach the lifting straps. The frame is moved off the edge of the site. With the frame completely moved, and ground tile also gone, the site is now fully clear ready for the ground preparation work for the complete build. Ground works will actually start in a few weeks, giving plenty of time for some surface thawing of the ground, making it easier to work with.